This site provides resources to assist teachers, schools and districts with the integration of educational technology into the curriculum. It is my belief that technology should serve the goals of empowering students to be independent learners and assisting teachers in their efforts to convey underlying concepts and issues. It supplements the teacher's role as guides in helping students uncover meaning and relevance in the topics studied. I work from the ‘Teaching for Understanding’ and ‘whole child’ approach in which the goal is deep conceptual comprehension, and not simply skill or factual mastery. I employ educational technologies and digital media with that goal in mind. Technology in the classroom can provide a platform for creative expression and collaborative work. The Internet offers opportunities for students to learn from other peoples and cultures around the world. A broader, international perspective deepens students’ understanding of their relationship to the rest of humanity, and helps them develop their concepts of social justice - important themes in every child's education. 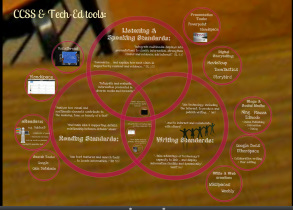 Numerous digital tools can be used to support Common Core learning goals. 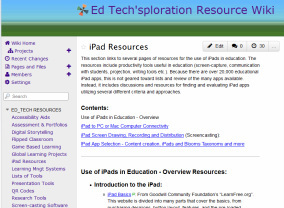 Find ed-tech tools and resources in the Wiki section of the site. 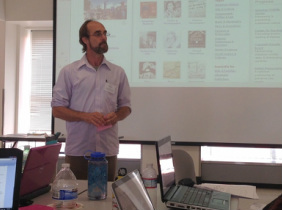 UC Berkeley History-Social Studies Project's Summer Institute. Are you looking to integrate technology into your classroom, but don't know where to start? The Resource Wiki introduces a select group of tools that may be what you're looking for. Visit the Resource Wiki Section.